Luci Lux is an elegant, lightweight inflatable solar lantern that collapses flat so you can take a little light wherever you go. 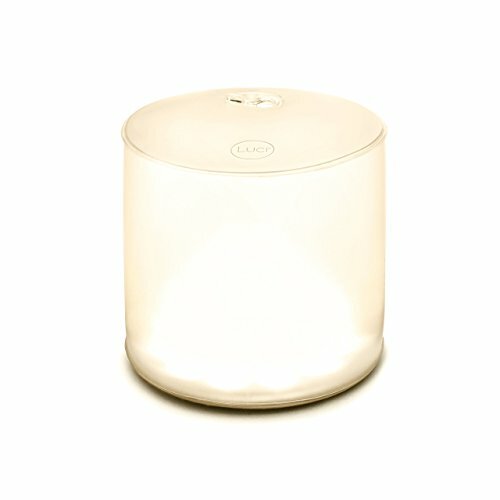 Just place it in direct sunlight for 7 hours and Luci Lux will last up to 12 hours on a single charge. Luci Lux shines beautifully in three settings: bright, super bright, and 1 second flashing. A convenient battery level indicator located near the light’s highly efficient solar panel lets you know just how much power is left so you know when it’s time to charge it in the sun again. Luci Lux merges the utility of a portable light with the aesthetic of modern home decor, making it perfect for dinner parties inside the home or on the patio, weddings, yoga and relaxation. Featuring a soft frosted finish and warm LEDs that glow just like candlelight, Luci Lux is a great gift for anyone who wants to add a stylish touch to their space. Plus, because it’s completely waterproof and floats, you can throw Luci Lux in the bath or the pool to turn any moment into a magical experience. If you have any questions about this product by MPOWERD, contact us by completing and submitting the form below. If you are looking for a specif part number, please include it with your message.